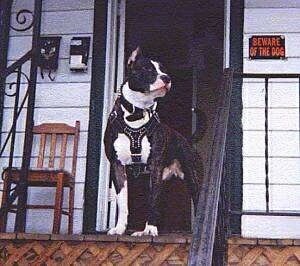 I was a proud owner of American Pitbull Terrier until someone took him away from us. He died on June 28, 2000; he was only 20 months old. He was and always will be the best dog son that we will ever own. Considering he was still young, he did his best to always please us. So of course since he did that, we would have to spoil our little one with whatever he wanted (well, anything that would not hurt him or get him sick). He was a big momma's boy. Everyone thought it was funny and for his Daddy, he always had to show his tough side. He was the opposite of all the stories we heard about the APBT being so mean and vicious. That is why we loved him so much, because he was different, one of the family. Anyone that loves pets like we do knows how we feel and felt the day he was taken from us. I still think that he is coming home to us; it was all just a nightmare. But it was not, it is real he is gone. We thank God that we have our memories and pictures of him doing what he did best, playing and sleeping. Animal was our little angel that was taken too soon and more people need to be aware that this breed of dog is truly special and deserves better than what they have been getting. This was our APBT (Animal) standing proud. 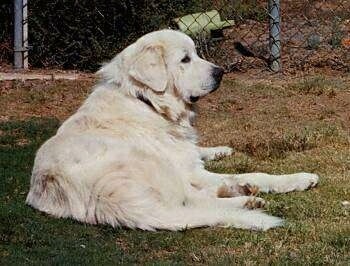 This was Febus, a Great Pyrenees, my friend and companion for eleven years. Despite his imposing size and noble demeanor, he was essentially an over-sized teddy bear who was both very gentle and affectionate. He was never very comfortable with strangers, but within the family, his boyish charm and remarkable sensitivity ensured his place as one of the best dogs we've ever had. He was always around for a big bear hug when you needed it. As he grew older, however, his hind legs began to give out and his quality of life really began to suffer. We were finally forced to put him to rest on October 10, 1998. That was one of the hardest things I've ever had to witness. We all miss the big lug and have many fond memories of him. I adopted Muggins in late 1994 when he was a pup. He was a 120-pound Rottweiler/German Shepherd mix. 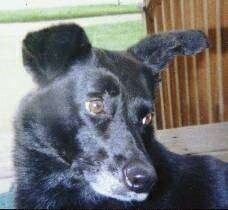 We were together for a very short 5 years before cancer and chemotherapy sent him to the Rainbow Bridge. He was my constant companion and after I retired from the Fire Department he and I made several animal rescues together. He was more human than a lot of people and I will miss him until we are reunited at the Bridge. I continue to rescue to this day and each one is a tribute to him. I love you, Big Boy. This is my beloved Sable. She died June 15, 1999, 5 days after her 13th birthday. It's still hard to believe that she is gone. We miss her so much. She brought so much happiness to our family and we loved her deeply. We cremated her and still have her ashes. She had a stroke on my birthday and then a second one about a week later and then we knew she had to be put to sleep when she couldn't walk anymore. We were with her till the moment she was gone. But we always remember how happy, lovable, loyal and playful she was. Thank you, Sable for being our best friend and for all the unconditional love you gave. We will always love you!! This is Bandit. He is a mutt. We found Bandit when he was only a couple months old. He had heartworm from being left out in the wilderness. We had Bandit treated and he became a part of the family. Bandit was so lovable and playful. He got along with the whole city, so we usually let him roam free. But one day when my sister and her friend took him on a walk, he ran ahead into the road. Bandit was hit by a car and we had him rushed to a veterinary clinic in the area. They kept him overnight and took x-rays. Bandit had a crushed hip and a snapped spine and if they did surgery there was a low chance it would work. We thought he would never be the same playful dog we knew, and we didn't want to see him in pain. 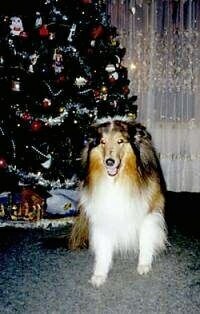 Bandit was put to sleep on November 6, 1997, just before his 5th birthday on November 24. We always hope another Bandit will come along, but we know no dog can ever replace him. Bandit lives on in our hearts.